Discussion in 'Indivisible' started by Aden, Oct 5, 2015. The fact the Kursarigama is used for swinging in exploration is awesome. It strikes me as a really nice blending of reflex/manual execution, and traditional rpg resource management. What I mean by that, is that there's a heavy action element in execution (combos) and reflexes (blocking), but at the same time you can't react/ninja your way through everything like you could in, say, Mario and Luigi series, where you can completely evade all damage. Chip damage will get you eventually if you don't play your cards right (or you'll run out of meter to block with). The resource management strikes me as pretty well done and deep. The fact that both offense and defense comes out of Idhi makes you really think twice about how you use it, and on top of that you have "time" as a resource too with the real time turn taking. I don't quite understand the combo system fully, but I like that there's a lot to learn as you progress. It does feel like a fighting game in that regard. All in all, I think it captures the dungeon crawl/resource management feel while being very fast paced and forcing you to think quickly on your feet, not to mention using manual skill. Taneisha Jane and KaboomKid like this. Anyone come up with optimal combo paths and sequences for building meter, especially for the boss fight? This one is for discussion of the combo system, game design, etc. I was actually going to put it all in your thread, but I thought you would want to keep it focused on finding the secrets, etc. I can merge them if you want. I'd like to just keep the next two years of discussion of the complete game separate from the prototype. e.g. discussion of combo optimization in the prototype would go in the prototype thread, and discussion of how combos could work in the future would go in this thread. I loved the gameplay, fast and straight to the point, i like how there is a combo mechanic, dealing fast and consecutive damage to the enemy makes taking multiple enemies all the more satisfaying, i'm still having trouble with guarding but that's because my reflexes are a bit dull, i end up guarding with the whole party more than once, killing my bar, i also sometimes get the buttons mixed up and end up accidently using attacks i didn't wanna use, all in all, the gameplay is amazingly done. Just finished the prototype. Really love it so far. Platforming/movement feels really smooth and nice. Not much to say here. Really like the battle system. I love the idea of having multiple attacks each with different properties that can combo in different ways. I love the Iddhi system; you need to manage it to make sure you have enough for both damage and blocking, which is very interesting. Honestly, and this is just opinion, I don't like the real time turns. I prefer to sit down and think about my next move, but the fact that I'm being timed I don't really enjoy. Another thing I dislike as a result of this is that you don't know when your opponent is going to attack, so you won't really notice the quick red flash indicating who is going to be hit. It also makes it a bit difficult to switch which enemy you're going to be attacking, since there is a time limit and every second counts. This doesn't mean I don't like the element of reaction in blocking, though. IMO, some other visual indicator of who's gonna be attacked might help. Like, instead of just a red flash, make the red glow more like the IPS state in Skullgirls. It's actually easy to tell when you're under attack, the hard part is telling who you have to block with, specially when you fight the boss. I mention that later in the sentence, that the fact that you don't know when you're going to be attacked means it can be difficult to know who to block with. I've also had an enemy do an attack on the rear member of the party that also hits the front member, but only the rear member flashes red. However it's very possible that there's some animation cue in the way that the enemy moves that I've missed or some such. i was just re-inforcing your statement. Has happened to me too, multiple times during the boss battle. Another thing i noticed within the gameplay is that it is actually possible to miss attacks if you push the enemy around too much, i'm not too sure how to feel about that. I think there's plenty of indication atm, not only do you have the red flash but you also have the time most enemies are walking up to you which usually provides a decent indication of who is going to get attacked. Only thing I find iffy about blocking currently is that it is rather awkward to block as both Ajna and Razmi for attacks that just hit them. This is however just because I'm using a controller though and there's likely little that can be done about it. Has this happened to somebody else? i feel it's a rather funny bug (or it could be intentional, i don't know), what happened here was that the hairy enemy used it's drill attack on Ajna, launching her onto that platform, she was unable to get down, and the slug-like enemies couldnt hit her, no matter what i tried i couldn't attack with Ajna or get her down so Zebei had to finish the battle, i wonder if Zebei can still attack if trapped up there too, probably yeah since he doesn't need to be close to the enemy to attack it. I'm sure it's intentional for attacks to miss if the enemy is too far out of position. Because there are attacks that pull them back. Was playing again tonight and I was really trying to pay attention to stuff that surprised me, or was unintuitive. One thing that got me was keeping track of Ajna's health. I'd often just look down and be all, "Oh wow, she's almost dead." Since she's the most important member of the party, it's kinda odd that I was surprised by it as much as I was. Maybe some minor HUD change further down the road to highlight her health bar compared to everyone else would be good? Color her section of the HUD in silver instead of gold or something. It might also help with people who are confused by the buttons swapping sides for Razmi and Ajna. It'd always be clear at least what button Ajna is on. Fighting with her hands instead of her axe. It's that simple. I like that, since it is a very obvious indicator that mashing the attacks isn't the best option to take. I don't know if there are changes to damage values or meter building if you hit with multiple characters at once instead of hitting sequentially, but even if that is the case it isn't an obvious problem with mashing, while missing attacks is. Is there currently a system that lowers the benefit - whether it is the meter gain or the cooldown - of an attack if you use that attack a lot (or might something similar be implemented)? Currently using the strongest and AoE attacks many times in one turn will make your bar fill slower for the next one. Other than that there is no special penalty for repearting same attacks. -What are all the benefits of doing combos, vs just using characters moves individually and not "chaining" things? -As I understand it, some attacks build more meter, some delay the enemy turn, and some cause you to recover your next action faster. Is this true (I know the first one is)? The the fact that the combat buttons switch still annoys me though, but that's just me. Otherwise, I like everything else, especially some of the subtler aspects/ mechanics. Yeah, that's what I thought. Are there any other benefits? Not in the prototype, no. In the final game, yes. It does save you quite a bit of time, and allow the enemy not to build action bar (in case you mess up your timing doing everyone separately). People seem to forget that it's a prototype a lot. It's NOT a demo. ... and allow the enemy not to build action bar (in case you mess up your timing doing everyone separately). Do enemies gain ATB when not in hitstun but before the green flash of positions being reset? Like punting an enemy with Ajna+Tungar then trying to time a full down-attack shotgun from Zebei as they're moving back to start. Does that technically count as a combo for metergain? Doesn't feel like either of these are the case but I figure I'd ask anyways for clarification. Yeah, was just curious. I feel like there's a lot of depth and things to learn and master in the game already (a good sign of course), so I don't want to skimp on any important details that I might be missing. Neither of those is true, no. Enemies only gain meter when you do, so you can see it pretty easily. I guess I don't really consider those important details, since they'll change and the meter is enough. Small feedback obviously not going to be changed in the prototype, but I spend virtually all of the battles staring fixedly on my ATB gauges, and not the fights. It's kind of a shame that all this cool stuff is happening up there and I only look up very occasionally to check if an enemy dropped out of a juggle or not, or to select targets. EDIT: If you don't want this kind of feedback on the Prototype, please say so! I didn't even think about the side switching button issue. It just made sense as it is, to me. Neither of those is true, no. Another combo question I havn't fully been able to figure out yet: What about enemies being knocked down? Does them rising count as not being in a combo? Does them hitting and laying on the floor not count, thus meaning you should keep a juggle rolling once you actually start it if the victim is a light enough target? I'm really glad we got an option to lock the battle command buttons, but it's the opposite of what I expected it to be. The main issue I had with battle buttons came from the fact I spend exploration sections hitting B2 to swing the axe around with Ajna and then suddenly she's B4 in battle. Can we have an option to have her on B2? Also: I gotta agree with Cellsai with the health things. 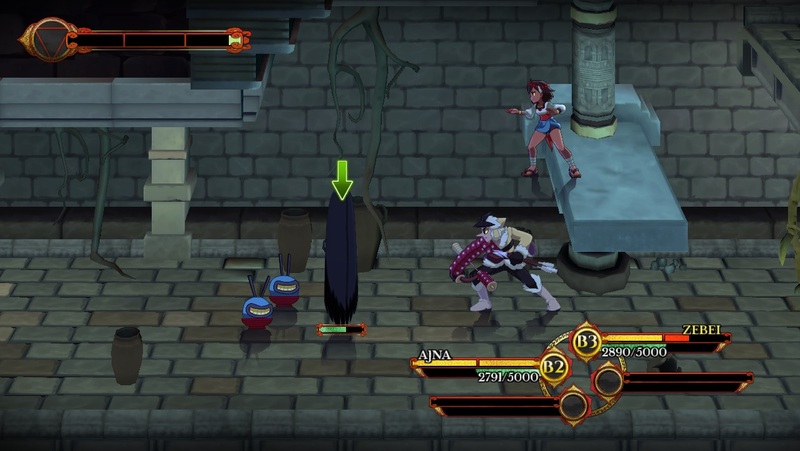 I also either spend the entire battle staring at the ATB bars or I just don't notice Ajna's health at all. But damn, the combat feels good. I'm very excited about the game. This game has me spoiled on wall jumping. Trying to pull off some wall jumps on this Mario stage and I keep botching it, since you have to hug the wall where as in Indivisible you just need to be close enough. Yeah, it is very smooth. When i was trying to get out of the pit, i noticed that at least the first few steps, you just need to jump from the right place at the wall and press the buttons fast enough.